We reported earlier today that Tesla began to roll out the highly anticipated software 8.1 to Model S and Model X vehicles equipped with the company’s autonomous driving hardware. The update follows several tweets made earlier this year by Tesla CEO Elon Musk, and as recently as last week during a tweet storm that was loaded with Model 3 reveals, aimed at keeping anxious owners of “hardware 2” vehicles at bay. Prior to today’s over-the-air version 8.1 update, Model S and Model X vehicles equipped with hardware 2 have been operating a more restricted version of Autopilot 2.0 that was missing notable features such as Auto Lange Change, Autosteer capabilities above 55 mph and Tesla Summon, among others. We published the full release notes for v8.1 (17.11.3) that includes a detailed description for Tesla’s newest Autopilot 2.0 features. Among the updates to Tesla’s driving-assist feature was also new updates to the Model X Falcon Wing doors. We have a first look at how version 8.1 being operated in a Tesla Model S handles real world driving situations. 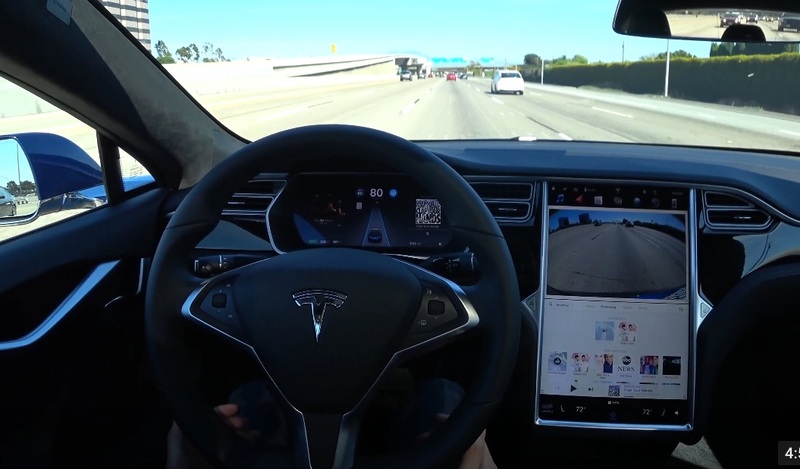 At first glance the update looks similar to any other Autopilot video, however it isn’t until the driver enters a busy Southern California freeway that we begin to see the improvements made to the latest 8.1 software. The Model S is seen handling lane changes smoothly on its own, via a flick of the turn signal, and keeping to its lane without experiencing the “Tesla dancing lines” that have plagued earlier versions of Autopilot 2.0 Autosteer. Though version 8.1 seems to navigate freeway conditions with more confidence, it’s still not on par with Tesla’s first generation Autopilot. One can see this behavior at the end of the video.